By Kym Horner – Marketing Executive. Published 7 September 2018. 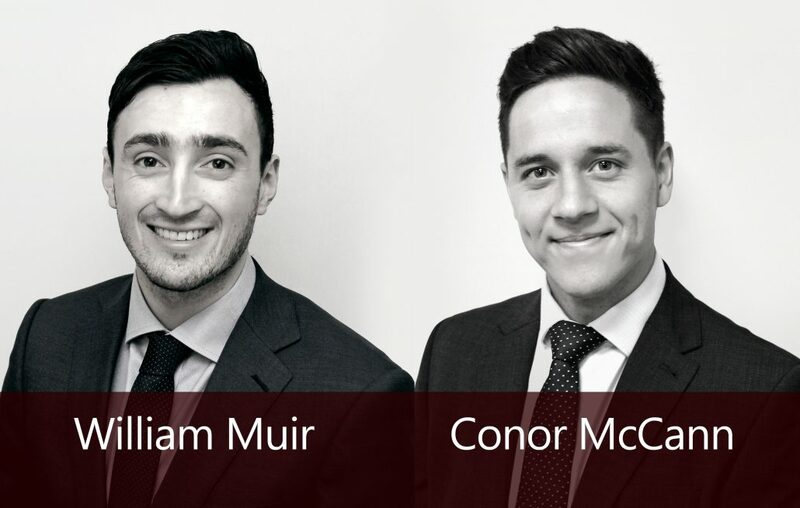 We are delighted to announce the appointment of our two trainee solicitors for 2018, William Muir and Conor McCann. William joined the firm in February 2016 as legal secretary to Associate Director, Suzanne Keenan. During this time William has ably assisted the Employment and Commercial Litigation departments in a range of matters for both commercial and individual clients. William will continue to work alongside Suzanne whilst commencing his studies at the Institute of Professional Legal Studies. Conor is new to the MKB Law team, joining the Corporate & Commercial department in August 2017. Conor will train and work alongside Managing Director, Gordon McElroy, while attending the Institute of Professional Legal Studies. Both trainees will aim to qualify as Solicitors in September 2020. MKB Law are one of the leading full-service law firms in Belfast, and as we continue to expand our portfolio of legal services, William and Conor will make key additions to our team.